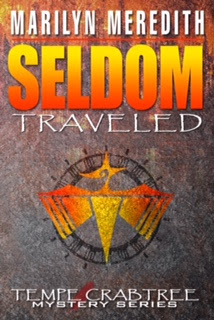 Details at the end of this post on how to enter to win a copy of Seldom Traveled, and a link to order it from Amazon. Seldom Traveled is the fifteenth book in Marilyn Meredith’s series featuring Deputy Tempe Crabtree who lives in the fictional town of Bear Creek, California. In this book, she deals with murder, a forest fire, and a runaway fugitive. In Seldom Traveled Tempe finds herself investigating the murder of wealthy socialite Mariah Konstanzer, who once lived in Bear Creek and had come back for a visit. She had been staying at her parents’ cabin, which is where her body is found. Tempe quickly learns that many local people had a good reason to murder Mariah, including the wives of some local men that she had slept with. Suspects also include Mariah’s assistant Amy Bennett whom she treated very badly, the handy man at the cabin, and Mariah’s ex. There is also a wanted man on the loose in their area, so he is added to the suspect list as well. Though Tempe is not a detective, everyone else is so busy with the missing fugitive and a raging forest fire, that she is called upon to help out by interviewing suspects. I always enjoy spending time in Tempe’s world where not only is there always a mystery, but we also get to learn more about her Native American heritage. I especially enjoy her interaction with her pastor husband Hutch. They make a great pair, and it is interesting to see them debate the spiritual side of her heritage compared to his Christian beliefs. This book was a particularly fast and fun read, with plenty of twists and turns in the mystery. Seldom Traveled may be my favorite of her books so far! To enter to win a copy of Seldom Traveled, simply email KRL at krlcontests@gmail[dot]com by replacing the [dot] with a period, and with the subject line “seldom,” or comment on this article. A winner will be chosen November 12, 2016. U.S. residents only. If entering via email please include your mailing address, and if via comment please include your email address. sounds like Tempe’s a busy girl. Sounds terrific – count me in, please! I really like how this post brought the series into focus. I am going to add this author & series to my must read pile.